New York Workers Compensation Attorneys | Work Accident Lawyer | Markhoff & Mittman, P.C. Home / Hurt at Work? If you work for a covered New York employer (almost everyone!) then you are eligible for workers’ compensation benefits if you are injured out of and in the course of your employment from the moment you begin work. In fact, your employer must ensure safe access to and from work and sometimes travel to and from work could be covered by workers’ compensation depending on circumstances. Furthermore, your injury doesn’t have to be caused only by a physical accident. Conditions or illnesses that occur over a long period of time are covered by workers’ compensation too. These include carpal tunnel syndrome, back problems, and stress-related problems such as mental health issues, heart attacks, and strokes. This is just one of many questions about workers’ compensation that we receive from our clients on a regular basis. Need help with your injury claim? We’re here to take your call. Under workers compensation, a worker is typically entitled to receive financial compensation when they are injured, no matter what caused the injury. In return for this right to limited protection, workers give up their right to sue their employer for negligence. New York State law requires employers to provide workers’ compensation benefits by purchasing insurance or by self-insuring. Benefits are set by a state formula and include payments for medical care and to replace lost income, as well as time off for medical reasons related to the injury. Ultimately, workers’ compensation is intended to protect workers and their families, while minimizing the need for litigation. New York is home to some of the most dangerous work conditions in America. While certain industries are inherently dangerous, such as the construction industry, an accident can occur in any type of work environment. These are just some of the accidents that our clients have been injured in, however we represent injured workers who were involved in all types of accidents. Employees can receive workers’ compensation for a variety of different types of injuries. In fact, your injury does not have to be caused only by an accident for you to obtain workers’ compensation. Conditions or illnesses that occur over a long period of time are covered by workers’ compensation too. Our attorneys represent workers in all industries and professions in New York. Whether you were hurt in a construction accident or injured at the office, we are here to help you recover the compensation that you deserve. These are just some examples of the industries and professions in which we represent injured workers. However, we represent workers from all industries to help them recover workers’ compensation and other forms of financial support. The application process for a workers’ compensation claim consists of many important and time-sensitive steps. Unfortunately, many injured workers denied the benefits that they need because they do not seek legal help when filing a workers’ compensation claim. Understanding the proper steps to take after a work-related injury can prove to be crucial in your efforts to obtain workers’ compensation as well as any other form of compensation that you may be entitled to. Just because you have a legitimate injury and cannot work, it does not mean that you will receive workers’ compensation. That’s because benefits are paid by your employer’s insurance company, which has an arsenal of lawyers who are paid to deny your claim. Denials are common during the first go-round of your claim because your case is handled by a third party insurer (not the State! ), which doesn’t like to pay up. When your claim is denied or your benefits are reduced or terminated, you are allowed to a hearing before a law judge. If you are at this stage and haven’t already gotten a lawyer, call Markhoff & Mittman right away. You are involved in a legal proceeding, and the other side will definitely be represented by an attorney. If the other side has a lawyer, you need one, too. Markhoff & Mittman attorneys will do all we can to ensure that you collect the benefits to which you are due. The thousands and thousands of cases we have won have given us the best experience possible to handle your case in the most effective way possible. We know the in’s and outs of gathering medical evidence, filing well-documented claims, and appearing at formal hearings. We know how to protect you from insurance company attempts to poke holes in your case, and we know how to handle all types of hearings and appeals before the New York Workers’ Compensation Board’s Judges and Commissioners. Have you or a loved one been injured at work? You have come to the right place. 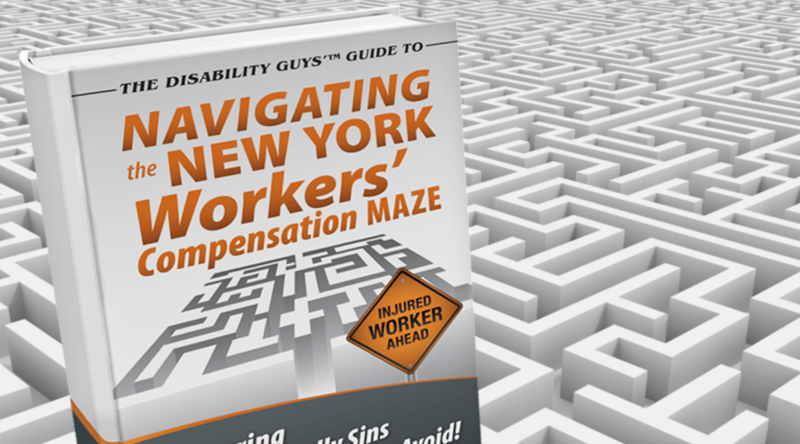 The Disability Guys have been serving injured workers in New York since 1933 and have helped thousands of injured workers in obtaining workers’ comp over the years. Call us today at (866) 205-2415 or contact us online to discuss your legal options after a workplace injury. Workers’ Compensation knowledge is vital for those filing. Here you will find monthly updates about various workers’ compensation accidents and settlements. A Middletown man has been arrested for workers’ compensation fraud. He has been charged with stealing more than $9,000 in benefits. The former FedEx worker had been claiming benefits after he alleged a debilitating shoulder injury caused by tripping over pallets at his workplace in April of 2015. However, in 2017, he was found to be routinely working out at a local martial arts school where his alleged injury did not prevent him from kickboxing, doing jumping jacks, and other workouts. His own physician was shocked and testified that he was “far from disabled” after watching video of the man working out. Legislation titled the Workplace Violence Prevention for Health Care and Social Services Workers Act is being heard in the House which aims to protect nurses and social workers from patients who are violent. Many workers are speaking about the threats and violence they have faced while at work, issues which often cause anxiety, depression, and physical injuries. A 57-year-old man has been accused of workers’ compensation fraud after surveillance video showed him faking his accident. In the video, the man is shown taking a cup of ice, spreading the ice on the floor, throwing the cup away, and then walking back to the ice and taking a gentle “fall”. He then waits on the floor for someone to “discover” him. He then filed claims for an ambulance trip to the hospital and various medical treatments. According to a report released by the Federal Aviation Administration, a maintenance helicopter become tangled in power lines that were being worked on by utility workers and crashed, bursting into flames. Two of the utility workers were killed in the crash. Two others were hospitalized and treated for their injuries. A New York man had been arrested and charged with both insurance fraud and perjury. The allegations against him state that he filed for workers’ compensation and collected payments while he continued to perform work for his family farm. A new report has shown that New York has overtaken California and is now the most expensive state, with $3.08 of every $100 of payroll spent on workers’ compensation costs. This is an increase over last year, which is shocking considering that nationwide workers’ comp costs are down. A construction worker in SoHo fell one story from the 4th floor to the 3rd floor of a building along with his tools landed on his head. Medics had to climb several ladders to reach him and then carried him to safety in a basket. Witnesses said he was bleeding heavily from his head while being loaded into the ambulance. A man has lost his life on a construction site due to a slip and fall accident and his saw. At around 11 a.m., police responded to a 911 call to find a construction worker bleeding heavily from his neck. They determined that he had fallen and when he did, the saw he was using fell on top of him, striking his neck and cutting deep into the tissue. Despite their efforts, he exsanguinated on the way to the hospital and was declared dead upon arrival. A man who was performing construction work at a job site in Brooklyn, NY fell several feet into a hole and sustained serious injuries which prevented him from getting out without assistance. Firefighters had to hoist him out so he could be taken to the hospital. A contractor has been ordered to pay more than $8,000 in restitution and fines after he admitted to failing to obtain the necessary workers’ comp for seven employees while they worked on a home. Under Workers’ Comp Law, the failure to obtain workers’ comp is considered a class E felony. A 62-year-old construction worker fell around 60-feet from scaffolding where he was working to install copping stone. He survived the fall and was rushed to the local hospital for treatment. Local Law 196 has officially gone into effect in New York City. This new law requires supervisors and workers to create a safety plan and to undergo training. Supervisors must undergo between 60 – 75 hours of training and construction workers must complete 40 – 55 hours of safety training. Three workers in East Harlem were injured when they were pinned by an iron beam. The heavy beam fell off of a boom truck, pinning them to the train tracks they were working near. Although their injuries were not life-threatening, they were taken to the hospital for serious injuries. More than 2,000 people sustain on the job eye injuries each year and in an effort to raise awareness about the dangers which can cause eye damage, March has been deemed Workplace Eye Wellness Month. A man who has worked for the Department of Sanitation for nearly 20 years may have sustained career-ending injuries recently. At around 12:30 p.m. on Tuesday, the street cleaner had a tire get caught in his truck and attempted to pull the object out. Instead, even though he had shut down the machine, the pressure the tire was under caused his entire arm to be pulled into the gears and crushed. He sustained a broken humerus and nerve damage. Just after Christmas, two subway trains collided injured one MTA worker who was taken to the hospital with non-life threatening injuries. Officials have not commented on why the two trains collided but did say neither one derailed. The Port Authority closed the Bayonne Bridge in both directions after a 49-year-old worker was seriously injured on the lower level of the bridge. Witnesses reported that the injury involved one of the employee’s legs and that he was clearly in shock. Six construction workers were hurt, four with serious injuries when a roof collapsed in Brooklyn, trapping them. The collapse occurred around 10 a.m. when a load of cinder blocks was hoisted onto the roof where apparently, the structure buckled under the weight of the blocks, sending the blocks and workers into the basement. A 31-year-old man who was on his moped on route to deliver Indian food was hit by a bus that was making a right hand turn onto Roosevelt Blvd. Emergency responders rushed him to Elmhurst Hospital where he is being treated for head and body trauma. His doctors expect him to survive but his road to recovery will be a long one. A 28-year-old subcontractor from Lebanon was recently crushed and killed by a heavy piece of equipment at an engineering and manufacturing company in Franklin. According to investigators, the man was a maker of vehicle parts. This company has already had workplace safety violations in the past and OSHA had issued several serious violations in 2010. OSHA is currently investigating what caused this man’s death. An employee at a meat packing company was recently injured when her arm got stuck in a conveyor belt. According to reports, it took about an hour to extricate the woman’s arm and this was mainly due to maintaining her safety. She was taken to hospital by helicopter to the University of Cincinnati Medical Center with extreme injuries to her arm but, the injuries were considered non-life threatening. A 45-year-old electrical worker died recently after he fell 75 feet at the new Little Caesars Arena construction site in Detroit. According to the Detroit Deputy Fire Commission, the victim had fallen almost 75 feet and went into cardiac arrest. His co-workers started CPR on him and emergency crews took over as they transported him to Detroit Receiving Hospital. He was unfortunately pronounced dead at the hospital. It was reported that the worker was not wearing fall protection gear when emergency crews arrived, but it is unclear if he was wearing the protection before CPR was administered. The Michigan Occupational Safety and Health Administration is set to investigate the accident. A construction worker fell to his death after a wooden platform gave way underneath him. The 62-year-old man fell over 10 stories by the Hudson Yards. The Montgomery N.Y. resident was working at 400 W. 33rd St., surveying the 16th floor of a huge Manhattan West development project by Brookfield Properties. He fell through a platform and landed on the 6th floor landing. Medics pronounced him dead at the scene of the accident. The victim was a surveyor who was hired by 50 States Engineering. The City Buildings Department issued a full stop-work order at the building. For more details about this accident click here. A 54-year-old man died after the bucket truck he was in overturned in Wayne Township. State police reported that the man who was a Penn Power worker was elevated inside the bucket of a bucket truck as he worked on a utility pole. Instability caused the pole to move backward and overturned onto its side. The worker fell from the bucket and onto the roadway. According to witnesses, it was a 30-foot fall. He was pronounced dead at the scene of the accident. A man working for a freight logistics company in New Jersey died after large aluminum poles fell on him. According to Howard County Police Department, the 54-year-old man was unloading aluminum poles when the poles shifted weight and ended up falling on him. He died on the scene of the accident. No one else was injured and there are no reported signs of foul play related to this accident. A 24-year-old worker died at a recycling facility after he was trapped inside a baler machine he was working on. The man sustained fatal injuries and was pronounced dead at the scene of the accident. Occupational Safety and Health Administration (OSHA) has opened an investigation which will include interviews with the employer, other employees, and any potential witnesses. During the clean-up of a massive mudslide off Highway 17 in Scotts Valley, California, one of two Graniterock workers was killed. The two workers were part of a crew that was clearing the mudslide when they were both run over by a construction truck. It was reported that the two men were pinned under the truck’s wheels and one of them died shortly after being struck. The second worker was rushed to the hospital where he was still conscious and talking. A worker was recently taken to a local hospital in Jacksonville Florida after he fell off a lift while changing light bulbs at a Southside warehouse. Police confirmed that the 74-year-old man was inside the building fixing light fixtures and bulbs at the time that he fell off of the lift. Witnesses state that he fell from 20- 30 feet and violently hit the ground. There is an ongoing investigation into this fall. Six people were injured after a fire broke out inExxonMobil’s refinery in Baton Rouge. Four people were critically injured. Anonymous sources stated that the fire started when a crew tried to restart the facility’s alkylation unit, used in the production of gasoline, which had been shut down for repairs. It is believed that the compressor blew out during the restart attempt and ignited a fire that caused severe burns on four of the work crew. The federal Chemical Safety Board (CSB) has launched an investigation into the fire, but it does not have the power to enforce regulations or give fines against the company. A man from Illinois working as a lineman in Winnebago County died from injuries he sustained in an electrical accident. The 30-year-old came into contact with charged wires and was flown to a Dane County hospital but he did not survive. His preliminary autopsy results show that he had an accidental electrocution. Local authorities and OSHA are investigating his death. In San Diego, a column panel fell on a construction worker at a work site and killed him. According to a Department of Industrial Relations spokeswoman, the accident took place after another employee was about to pour concrete into a form. The form fell over and toppled over on the other worker. The state’s Occupational Safety and Health Administration is investigating the death. A 34-year-old construction worker had to have his left arm amputated after an accident inside an elevator shaft took place. The accident took place at a building that was under construction in the 700 block of North Hudson Avenue in River North. According to fire officials and police, the man was transported to Northwestern Memorial Hospital in critical condition where he underwent surgery. In Avon, a construction worker was recently struck and killed by a dump truck in a construction zone. The worker was an Avon resident and he was pronounced dead at the scene. The truck he was directing mysteriously struck him, according to the police. Both the construction worker and driver worked for KMU Trucking Inc. It is unknown whether or not charges will be issued, but there is an open investigation into the accident. On June 7, 2016, Mamaroneck police reported that a utility worker fell down into a manhole. The man was able to pull himself out of the manhole and he reportedly suffered some injuries, but the extent of the injuries was not immediately known. Recently, organized labor took to the streets of New York City near 1 Wall Street to protest a 50-story bank building’s conversion project. The protest was over the project’s developer who is being accused of not caring about the lives of New York City workers. Several tradespeople gathered in protest for responsible development. The protest comes after New York City observed Workers Memorial Day in remembrance of construction workers who lost their lives on the job. Attempts to change the New York State’s Workers Compensation Board have recently been shelved and do not look like they will be part of the 2016-17 budget. The reasons behind putting off these talks, for now, are in part due to the complexity of the system for workers who are injured on the job, as well as other pending issues that are currently under debate such as minimum wage and family leave. Republican-led Senate and Democratic Assembly both rejected changes to the Workers’ Compensation Board proposed in their budgets in March. Recent reports have discovered that several doctors who used to accept workers’ compensation insurance have opted out of the program, but they still find themselves listed as participants by the New York State. Injured workers trying to find a provider are suffering the consequences of this issue. In one case an injured worker was provided a list of 64 doctors to attend to his injuries, however, not one of them could assist him because they no longer accepted workers’ compensation. On Thursday February 4th, 2016 a Manhattan construction worker fell six stories and died. The man was standing on a fire escape according to authorities. He was a 62-year-old man from Queens who was replacing gutters at a building on 124 E. 107th St. in East Harlem. The man is believed to have slipped and fell six stories down. Unfortunately, he was not wearing safety equipment and was pronounced dead at the scene of the accident. This incident is being investigated by the Department of Buildings. In April 2014, two men were killed when a crane they were working on overturned and fell nearly 140 feet while they were harnessed to the crane. These deaths should never have occurred. A settlement agreement has now been reached between the U.S. Department of Labor and Mass Bay Electrical Corp., that ensures the East Boston Electrical contractor the men were working for, provides extensive corrective action. The corrective action is set to prevent future deaths and injuries. A training fund has also been established in memory of the two men who died.